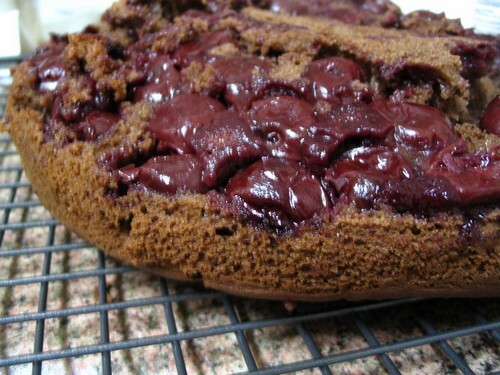 A few days ago I decided I wanted to make a chocolate cherry cake without a recipe. I’ve made a chocolate cake without a recipe before and it turned out quite tasty. It’s a great way to use up bits and pieces in the fridge. Lay cherries out on the bottom of a lightly greased cake pan – do not under any circumstances use a spring form pan, unless you enjoy cherry juice leaking out and running down the cupboards, oven, floor. Yes, this happened to me. Start sifting in flour – roughly a cup. Spoon the batter over the cherries, place in the oven and bake until a skewer comes out clean. Turn out onto a rack to cool – the cake may fall apart at this stage, but it will taste just as good. Promise. Now I wouldn’t mind having a go at that – instead of giving measurements, just have recipes with the ingredients. Interesting to see how different everyone’s could come out.